The 488 Pista Spider is Ferrari’s convertible adaptation of the performance-focused, special series edition of the existing 488 model line. Beginning their production of drop-top sports cars in the 1950s due to the overwhelming demand in the American market, the Pista Spider marks the prancing horse’s 50th convertible model in history. The name “Pista” comes from the Italian term for racetrack, lending an idea of what Ferrari had in mind while designing the car. 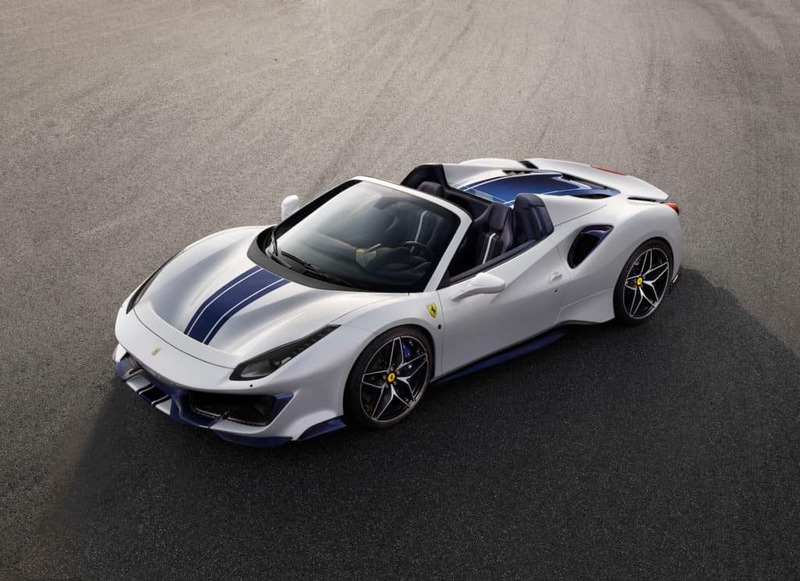 The 488 Pista Spider blends premium Ferrari style and racing technology with the ability to drive with the top down, creating a unique supercar experience where the driver can enjoy the open air of the road. The car boasts a mid-rear mounted twin turbo 3.9 liter V8 engine that produces 710 horsepower and 568 lb-ft of torque, making it the most powerful V8 Ferrari has ever offered. With this power, the Pista Spider sets a new Ferrari benchmark for power to weight ratio in a spider model. With zero turbo lag, the engine’s application of horsepower feels smooth yet powerful, recording an impressive 0-60 time in 2.85 seconds. The engine alone has been recognized around the world as one of very best V8s available, receiving the International Engine of the Year award in 2016, 2017, and just recently in 2018. 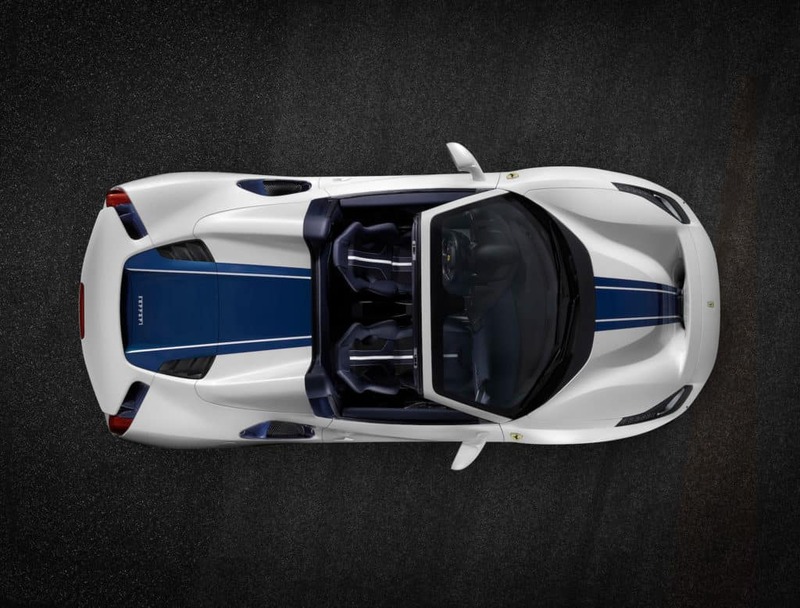 Losing the roof on this car doesn’t mean any sacrifice in performance, as this engine will still propel the Pista Spider to a top speed of 211 mph. The Pista Spider joins a long line of racing bred Ferrari convertibles for the road, including the 430 Scuderia 16M and the 458 Speciale Aperta. Designed by the Ferrari Styling Center, the Pista Spider borrows elements from Ferrari’s Formula 1 car culminating in a convertible design with an aggressive, track-ready look. 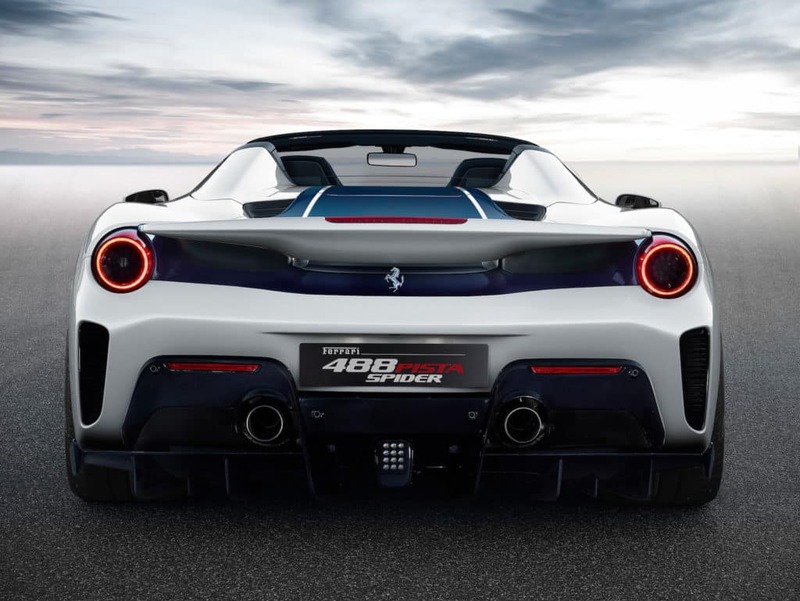 New on the Pista Spider is a stability control system called the Ferrari Dynamic Enhancer, making it easier to drive this car on its performance edge. In addition to the new stability control system, many other pieces of aerodynamic technology, including the menacing-looking rear diffuser, help the Pista achieve peak performance. Improving on many of the things the 488 Spider already excelled at, the Pista Spider allows its driver higher revs, more responsive acceleration, and sharper turning capabilities. The seven-speed dual-clutch transmission achieves shift times to emulate the instantaneous shifts of a racing sequential transmission. Ferrari’s Variable Torque Management system gives the diver a helping hand in taming the power and performance of the Pista Spider, managing the rev limits of the engine at all the right times. To further help the driver control this beast, the Slip Control System constantly monitors steering angle, brake pressure, and downshift speed to achieve maximum grip when needed. 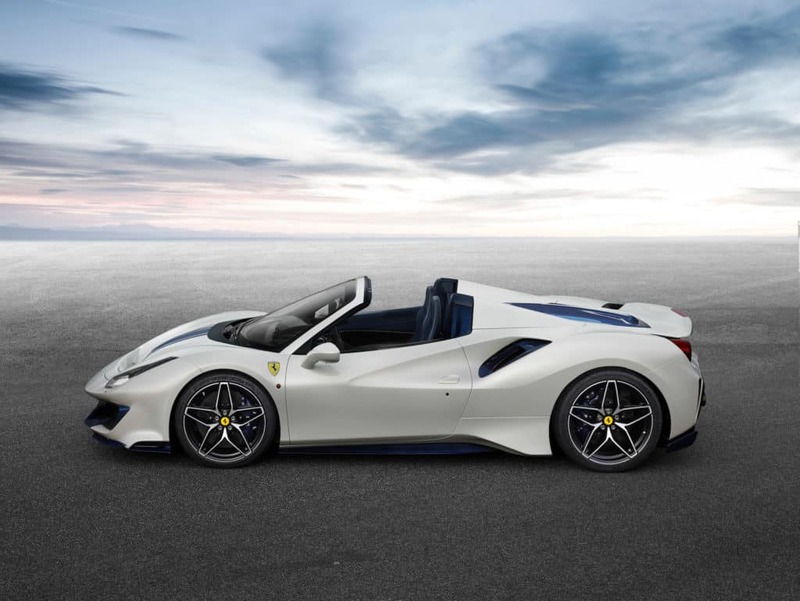 With the introduction of the Pista Spider, Ferrari is offering peak performance on the road with the option of having the top down, essentially the ultimate combination of luxury car and supercar. Despite the heavy retractable roof system, the standard weight difference between the spider and the coupe is only around 150 pounds. Also available on the Pista Spider are Ferrari’s new 20inch diamond finish alloy wheels, which perfectly compliment the overall design of the car. The Pista Spider is finished off with a racing stripe that runs the length of the car, expanding near the rear wing to represent the flow of air while driving. Elsewhere on the car, steel parts used for the 488 Spider are replaced by aluminum parts to save weight. The final product of all this is an exclusive convertible that bring peak Ferrari performance to the road, all with an open top. 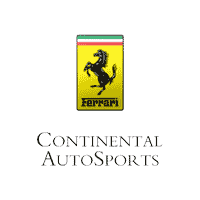 Discover the Open Sky Performance of the Ferrari 488 Pista Spider in-depth at Continental AutoSports.